Sure, it’s not technically a sport, but the draft receives as much attention — from both media and fans — as any sporting event in the calendar year. From early February through late April, one subject dominates talk radio and Internet message boards in NFL cities: Which player will my team select in the first round? We’ve got the answer to that question and a lot more. Athlon Sports NFL Draft Guide dives deep into the 2019 draft class with in-depth scouting reports on 218 of the top prospects and position-by-position rankings of 526 draft-eligible players. We also take a detailed look at every NFL team with depth charts and personnel needs for the upcoming season. This year's magazine also includes a profile of the most intriguing, electrifying and polarizing player in this year's draft, Oklahoma quarterback Kyler Murray, who is shunning baseball to take his shot at the NFL despite his perceived physical shortcomings. We also include a mock draft, a draft board, a peek ahead at the 2020 draft and much more. 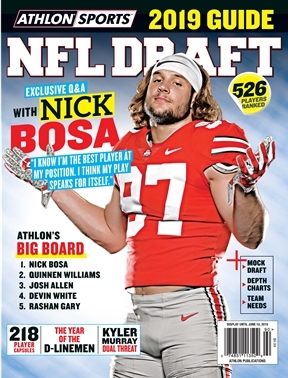 Athlon Sports NFL Draft Guide offers the most complete preview of the 2019 draft.